Sean, I didn’t know you that well, but what I knew of you, was that you were a great cop. I’m sorry that you lost your life like this. I know that Krissy will never truly get over you being gone. Rest easy Brother as we lay you to rest this week. You died doing what you loved - and trying to do the right thing. Thank you Officer Tuder for your dedication and for paying the ultimate sacrifice for the fine folk in the great state of Alabama. You are a true AMERICAN HERO !!! My thoughts and prayers are with your family, friends and co-workers. My you forever, rest in peace, my brother. Praying for the family and my family in Blue. It saddens and hurts my heart when I hear that we have lost another of our dedicated family members in the line of duty. Although our purpose is to serve and protect it does not render the pain less. I pray that God mends the hearts of the Tuder family, for we all know that it is an unbearable pain to lose those whom we love. Thank you for your service Officer Sean Tuder. May you rest in the heavenly arms of our father, and walk the righteous path with those whom have preceded you. Rest in peace. Your watch is over brother. Thank you for standing up and taking an oath, in a time where it truly does take courage to wear a badge. Final Salute Officer Tudor. Thank you for your service. You are a hero. Rest peacefully in the presence of God. We are praying for the family and fellow officers. Rest In Peace Brother. Prayers for the family and department. Sean, you rest easy brother. You are now guarding the heavens. You will not be forgotten. May you forever find peace in the fields of Valhalla. My deepest sympathy goes out to all the families of officers killed in the line of duty by a perpetrator. My family and closest friends are in law enforcement and it is very disturbing when an officer is dead and the offender is taken into custody, using ng g tax payers funds for thief trial. When incidents take place where an officer is killed at the hands of someone else, the police should make sure he or she suffers the same fate. My God watch over all the officers killed in protecting the citizens of this country.R.I.P. Rest in peace Officer Sean Tuder. God rest your soul, good and faithful servant. God bless your family and Blue family with His peace. While most people were enjoying football and freedom, my brother in blue was doing what we in Law Enforcement do keep the public trust and keep the public safe. There are no words for this truly unfortunate act. Rest in Peace, may God keep you close to him. !!! 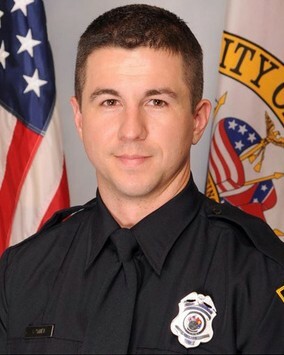 The National Police Wives Association would like to extend their heartfelt prayers to the family of Officer Tuder and the Mobile Police Department during this time. Thank you, Officer Tuder, for your service. Officer Tuder, you look like a young, upstanding man in your photo. Only God knows why He has taken you back to Himself at a very young age. Your service was short, but our all-loving, all-knowing God will reward you for putting your life on the line to protect your fellow citizens. May God immerse you and those you've left behind in His Divine Mercy. Rest in peace, good and faithful servant. The men & women of the Abilene Police Department, extend their condolences to the family, friends, and coworkers of Officer Sean Tuder following his death. We are grateful for his chosen life of service to his community and offer prayer to those who remain without his presence. Officer Tuder, Such a tragic end to your life and your young career. May GOD bless you and your family (Blood & Blue) abundantly during this time of loss and mourning. Thank you for your service to the citizens of Mobile and your Ultimate Sacrifice. You will be missed but not forgotten. Rest In Peace Brother!! !